Does a planting basin, like a zai pit, make much of a difference in soil moisture on a sandy soil? One would expect that, because water leaches through sand rather quickly, planting depressions might not have a significant impact on soil moisture. With the soil in ECHO research plots in South Africa being comprised of 87% sand, it was important for us to address this. To do so, we measured volumetric water content (VWC) over time, to a 12 cm depth in the zai pits. Within a given amount of soil, VWC is the ratio of the volume of water to the total soil volume. Expressed in terms of percent, the VWC at saturation will equal the percentage of the soil that is pore space. The VWC of a saturated soil is typically around 50%. Even though soil moisture tended to be higher with non-manured pits than non-manured flat ground, the difference was not that large. This was expected, since rainwater passes quickly through a sandy soil, regardless of the water catchment capacity of the zai pits. Adding manure to the zai pits substantially increased soil moisture, in comparison to that with no manure, up until 83 days (nearly 2 months after sowing sorghum seeds in the pits) after the pits were dug. Differences in soil moisture were more pronounced early than later in the season. By day 137, coinciding with sorghum harvest, soil moisture was nearly the same with all treatments. This could be an effect of the zai pits filling in with sand over time and/or less and less rainfall towards the end of the rainy/growing season. 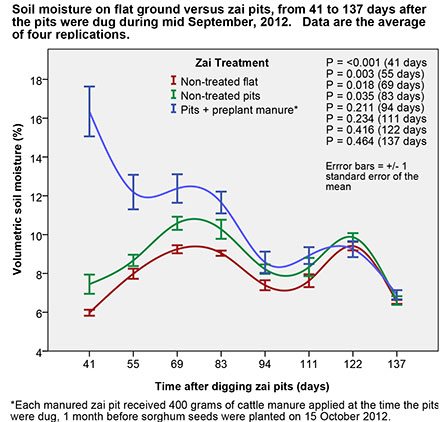 The most important finding here is that the targeted placement of manure, in a zai pit, greatly increased moisture retention near crop plants. A previous post showed that manure also greatly increased plant essential nutrients. Is it possible to achieve the same results on flat ground, with the manure placed near the crop plants? We tried that (data not shown here), but the manure increased soil moisture and fertility to a greater extent when placed in a planting basin than when lightly incorporated into soil on flat ground. That said, whether you are placing manure in a planting basin or on flat ground (around the base of crop plants or in a band adjacent to a row of crop plants), these results illustrate the role of organic matter in maintaining soil moisture.